This post has been sponsored. As always all opinions are honest and solely mine and JustaBXgirl’s. The new update includes a range of new fruit ingredients that can be used with the all-new blender for delicious smoothies! The cost for users wanting to unlock new items in the upgrade will be $0.99 USD. The unlock all package for new users will now cost $4.99 USD. As you know by now, we are here for Dr. Panda games. When asked if we wanted to test out the new Dr. Panda’s Restaurant 3 I’m not sure who was more excited JustaBXgirl or me. We ended up downloading it on my phone instead of her iPad so that we would have it on the go. JustaBXgirl has the other restaurant games as well so we were happy to add this one to the family. This one feels a little more business like to me. In the earlier games you were just concerned with preparing and serving the food. Now you have more goals. You want to gain status through good service and earn coins to buy things for your restaurant. I think it is great for the 4 and older crowd. I like that if you have played the previous games you can easily identify how things work without feeling like you’re in the same kitchen. If you haven’t played before you can still easily figure out how to make things work. And, since there’s no timer on the game you can take your time to explore and get to know your kitchen. JustaBXgirl said she liked being able to choose the meals to prepare from a menu. Don’t worry, the customers still give you hints into how they like their meals prepared. They will let you know if they do or don’t like ingredients. That’s always one of my favorite parts of the game. She also really liked being able to purchase items for the restaurant. It made it feel more like it was her restaurant. I’m a big kid and I love the Dr. Panda brand so it’s no surprise that I was impressed. JustaBXgirl is the harder one to impress. Once again, Dr. Panda achieved their goal. This game even had JustaBXgirl’s nine year-old cousin asking to play. I also think this game is a fun way to introduce different types of food choices to littles. Imagine having a little that likes to prepare all types of funky foods on the game but isn’t into trying anything other than pasta or pizza in real life. 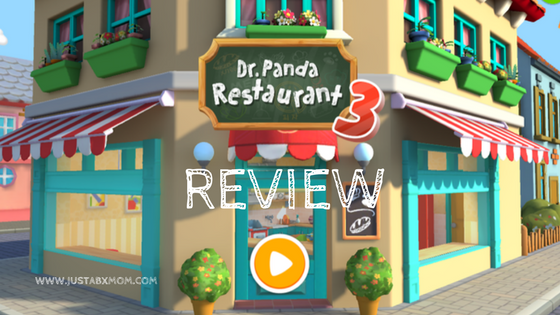 Why not create a real life Dr. Panda Restaurant at home? Each of them are fun and can be stand alone. JustaBXgirl loves the vacation feel of 2 and the business feel of this one. Yes, allowing her access to my phone is always a balance and usually to keep my own sanity! Dr. Panda Town: Vacation Update!